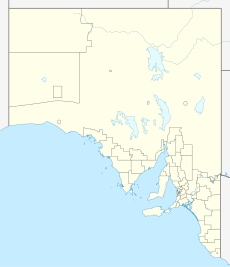 Lucindale is a small town in the south-east region of South Australia. The town is located 345 kilometres (214 mi) south east of the state capital, Adelaide. At the 2006 census, Lucindale had a population of 301. The town is best known for hosting the annual South East Field days, attracting over 26,000 visitors every March. The town was proclaimed in 1877 and named for Lady Jeannie Lucinda Musgrave—the wife of the Governor of South Australia, Anthony Musgrave. It was a station on the Kingston-Naracoorte railway line which opened around the same time and closed on the 28 November 1987 then dismantled on 15 September 1991. A school was established in 1878. The Post Office opened on 1 May 1877 but was known as Baker's Range for a few months. Lucindale is home to a health centre, licensed post office and newsagent and a service station. Education from reception to Year 12 is provided by the Lucindale Area School. The town was named Australia's tidiest town in 1994 and was a finalist in 2006. The town has an Australian Rules football team competing in the Kowree-Naracoorte-Tatiara Football League. Sandy Roberts – television personality and sports presenter. ^ a b c d "Search result for 'Lucindale, LOCB' with the following datasets selected - 'Local Government areas', 'SA Government Regions', 'Counties', 'Postcode', 'Suburbs and Localities', "Government Towns', 'Roads', 'Land Development Plan Zone Categories' and 'Gazetteer'". Location SA Map Viewer. South Australian government. Retrieved 25 February 2018. ^ Australian Bureau of Statistics (27 June 2017). "Lucindale (Urban Centre)". 2016 Census QuickStats. Retrieved 25 February 2018. ^ Australian Bureau of Statistics (27 June 2017). "Lucindale (State Suburb)". 2016 Census QuickStats. Retrieved 25 February 2018. ^ "GEOGRAPHICAL NAMES ACT 1991 Notice to Assign Boundaries and Names to Places (in the District Council of Lucindale)" (PDF). The South Australian Government Gazette. Government of South Australia. 3 December 1998. p. 1711. Retrieved 4 December 2018. ^ Bureau of Meteorology Retrieved on 21 June 2008. ^ a b c d "Lucindale Post Office". Climate statistics for Australian locations. Bureau of Meteorology. April 2014. Retrieved 3 April 2014. ^ Australian Bureau of Statistics (25 October 2007). "Lucindale (L) (Urban Centre/Locality)". 2006 Census QuickStats. Retrieved 2008-06-21. ^ "Lucindale South Australia". Travelmate. Retrieved 2008-06-21. ^ "Lucindale". The Manning index of South Australian history. State Library of South Australia. Retrieved 2008-06-21. ^ "Services". Lucindale Community website. LINC. Retrieved 2008-06-21. ^ "About us". Lucindale Area School. Archived from the original on 19 July 2008. Retrieved 2008-06-21. ^ "Australian Tidy Towns Awards – Results 1991 – 2007". KESAB environmental solutions. Retrieved 2008-06-21. ^ "Lucindale: Centre of the Limestone Coast". LINC. Retrieved 2008-06-21. ^ Full Points Footy. "Kowree-Naracoorte-Tatiara". Retrieved 2008-07-25. ^ Devlyn, Darren (2007-07-04). "Sandy Roberts' wake up call". The Sunday Times (Perth). Retrieved 2008-06-21. ^ Homfray, Reece (25 November 2017). "From schoolies to Sydney, Darcy Fogarty and mates celebrate as he becomes a Crow". adelaidenow. Retrieved 4 April 2018. This page was last edited on 4 December 2018, at 05:21 (UTC).